(Bloomberg) -- U.K. house-price growth continued to slow last month, providing further evidence of a weakening property market. Prices were 1.9 percent higher on the three months to May on an annual basis, down from 2.2 percent in the period through April, mortgage lender Halifax said in a report Thursday. On the month, prices rose 1.5 percent, reversing a decline in April of more than 3 percent. British housing prices have been weakening for years after a three-decade boom. Lower demand because of Brexit, slower economic growth and stretched valuations will probably continue to weigh on the market. 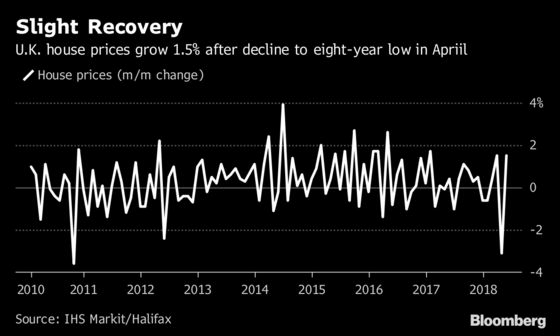 “The latest price changes reflect a relatively subdued U.K. housing market,” said Russell Galley at Halifax. Still, Galley noted that recovering household budgets are helping underpin prices, which now average 224,439 ($300,000). “We are also seeing pay growth edging up and consumer price inflation falling, and as a result the squeeze on real earnings has started to ease,” he said.